And in the end, it is not the number of years in your life that counts, What counts is the life you have enjoyed in these years, Happy Birthday! For the year that passed belongs to the language of last year and the coming year words await another’ s voice. Count not the candles See the light they give! Count not the years, but the life you live! Wishing you a wonderful time ahead! Happy Birthday! Awesome, sensational and inspirational and lots of fun, you have always lived life this way, to this very day wish that never changes as our turn your life pages. Happy Birthday. I hope that today is the beginning of a great year for you. Happy birthday. Age is just a case of mind over matter. If you do not mind it, it should not matter. Your life is nothing but a gift from the creator of the world. Your return gift to the creator is actually what you do with your life. Today are celebrating your Birthday and I see you the oldest ever and the youngest you shall ever be. You are not too old to set yet another destiny or dream a new dream. Happy Birthday! Wish you always pirouette through life with grace and elegance. I hope you have a wonderful day and that the year ahead is filled with much love, many wonderful surprises and gives you lasting memories that you will cherish in all the days ahead. Happy Birthday wishes. Yesterday was a beautiful reflection, today is the new beginning, Tomorrow is the endless possibility, Happy Birthday! We do not turn older with years but newer day by day. On this special day, I wish you all the very best, all the joy you can ever have and may you be blessed abundantly today, tomorrow and the days to come! 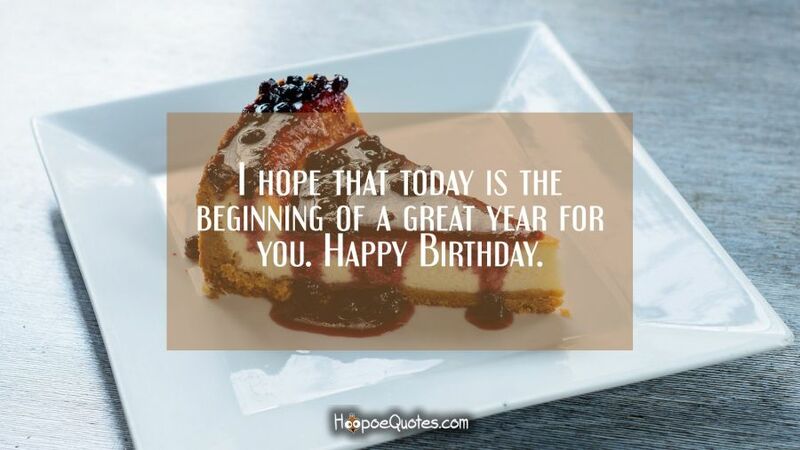 May you have a fantastic birthday and many more to come… HAPPY BIRTHDAY!! You will soon start a new phase of life! But that can wait until you are older. Enjoy another year of being young. Happy Birthday. True happiness come from within your heart, but you have to allow it inside you first. Happy Birthday. You have a birthday twinkle in your eye so have fun and know we love you fairy, fairy much. Happy Birthday. May life’s brightest joys illuminate your path, and may each day’s journey bring you closer to your dreams! HAPPY BIRTHDAY! You are almost perfect, but they say that we could all use a little change. So, I guess since it is your birthday, you should change your age. Some people look old and feel young. Some people look young and feel old. Some people like us look young and feel young. Feels good to party on your birthday doesn’t it? They say sometimes it’s hard to understand, but time tells truth. The truth is that I wish you a very happy birthday. Strike up conversations with strangers at stores and on the street and show interest & make yourself the life of the party always. Happy Birthday. Have you ever noticed how much cheaper it is to send someone an email for their birthday instead of buying them a present? Way cheaper! Anyway, Happy Birthday. Another year has passed but rather than count the years, let me just say how much we count on you. Happy Birthday. May all your wishes come true but one, so you always have something to strive for. Happy Birthday! Wishing you health, love, wealth, happiness and just everything your heart desires. Happy Birthday. May you day be beautiful and may your heart be happy and may you celebrate birthdays for many years to come. Wishing you more fun than a monkey in a tree full of fruit – like it is really possible to be happier than that lucky guy. Happy Birthday. For your birthday I thought that i would give you some good advice, but then I remembered that you have a lot more experience on getting older than me. A birthday means that you are a year older but a birthday party means you get to act 10 years younger. Enjoy the party! It is not enough to celebrate just one day, so celebrate EVERY day for the rest of your life. But start today. Happy Birthday. If birthdays were wishes, yours would have all have come true – since you have had so many. Happy Birthday one more time. Let your birthday inspire you to acknowledge the happiness you share with all of your friends and family. If you can’t wait until tomorrow because you get better looking every day, then I can’t wait until next year! Happy trip around the sun! On your birthday, you can party till the cows come home. Just be careful where you step. Happy Birthday! Have fun celebrating your birthday but remember that tomorrow you may have to answer a few questions about your experience. Having a birthday is a great step in the right direction to a long and happy life. In fact you can never get there without a lot of them! Let a little sunshine in and a little out for other people as well. Happy Birthday! There is no difference between you and a sunny day. Happy Birthday! I hope you spend this great day of the year with your family and friends because they love you. Happy Birthday! I hope this is the beginning of a prosperous year for you. Happy Birthday!